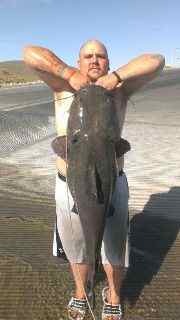 Pictured Above: Phillip Smith with his 50-inch catfish from Lake Pleasant on June 13. Said local catfish enthusiast Bobby Wright: "I haven't seen so many people fishing for catfish since Ed caught his." 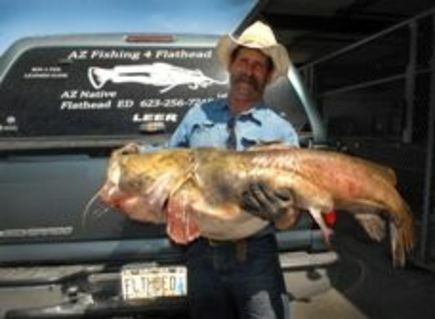 He's Arizona's latest fishing legend, the definition of doing your name proud. "Flathead" Ed, he is called. Eddie Wilcoxson, Photo #2 carved out a new standard in April with a 76.54-pound flathead catfish from Bartlett Lake, which became the heaviest recorded fish of any species in state history. Forums have been buzzing about the record. Challenges are being tossed like dripping laundry. The record must go, some say. 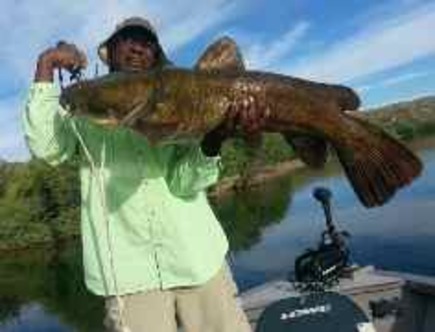 "Pleasant has been producing some very large catfish the last couple weeks," Wright said. Wright said Phillip Smith caught the catfish that measured 50 inches in total length (Flathead Ed's was 53.5 inches), but Smith could not find a capable scale, and so released the fish in good condition. Smith caught the flathead between 15 and 25 feet of water on 30-pound monofilament line and a 10/0 Big River sickle hook with a live bluegill at 1:30 a.m.
Kenny Walker's, Photo #1 caught this 41-pound flathead catfish from Lake Pleasant. Walker's toad was caught with an 808 Zebco reel on an 8-foot Berkley Big Game fishing rod, 20-pound monofilament line and a 5/0 circle hook. Like many nighttime catfishers during the summer, Wright targeted the cats near the bank, in 7 feet of water. "I had the rod laying on the edge of the boat," Wright said. "My wife saw it bend and I actually had to catch the pole." Like Walker, Wright also uses circle hooks, which allow a fish to be hooked without the angler having to set the hook. The hooks are designed to naturally hook a fish in the corner of its mouth - even if the fish swallows the bait - allowing the angler to easily pull out the hook and increase the odds of releasing the fish in good condition. "Especially if I'm fishing under a float I'll use a circle hook, because under a float the catfish have to pull real hard to get the float to go down," Walker said. "Right now most of the fish are being caught off large bobbers. Suspend bait a couple feet from the bottom and hold on." Walker said he likes catfishing because, "it's not like any other fish. You have to work." Walker gets his bait, usually bluegill (carp also are effective), dropshotting a ��-inch piece of nightcrawler. At Pleasant, that's in 15-20 feet of water against cliff walls. The bluegill can be hooked just under its spine (a bit behind its eye) on an 8/0 or 10/0 hook. Match the size of the fish to the hook so that the hook doesn't overpower the fish. But live bluegill are not allowed as bait in all state waters. Refer to pages 12-13 of the 2012-13 AZGFD Fishing Regulations guidebook for details of legal use of certain species of live baitfish in certain areas. Sunfishes (including bluegill, redear sunfish, green sunfish and hybrid sunfish) are permitted on all waters in La Paz and Yuma counties; the Colorado River south of the Nevada-California boundary downstream to the Southern International Boundary with Mexico, including impounded reservoirs; the Gila Salt and Verde rivers, including impounded rivers; urban waters in Maricopa County; and Lake Pleasant, Alamo Lake and Patagonia Lake. And fish cannot be transported from one fishery to another. Back to the fun stuff. Walker said he has a 16-foot center console boat with a kayak on his kayak rack. Because it's not easy casting the 100-pound PowerPro main line with 200-pound Dacron leader he likes to use for catfish, Walker will use the kayak to drop the bait in his preferred spot. He likes a 24-inch leader on a 6-foot-6 inch tuna rod with Diawa Sealine 40 reels. "You'd think we were fishing for tuna out there," he said. 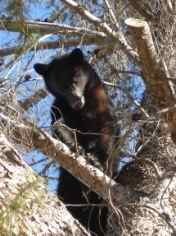 If the thought of tasting blackened catfish street tacos with jalapeno slaw sets your mouth watering, you'll want to get the next issue of Arizona Wildlife Views magazine. Johnathan O'Dell's "Dining After Dark" article describes the delights of pursuing those creatures of the shadowy deep known as catfish -- and gives a great-tasting recipe to use when you succeed in catching them. Subscribe online or by calling (623) 236-7224. If you're not in the mood for catfish, the high country fisheries are an obvious option. See the full report for stocking details.